School shootings are exceedingly rare, but frustrated and anxious students can be found every day. School districts across Maine are hiring police officers to roam the halls in the event the unthinkable happens. But more than anything else, those officers have to be ready for the typical. As terrifying and tragic as they are, shootings like the one earlier this year at a high school in Parkland, Florida, are exceedingly rare. Since the Columbine shootings in 1999, there have been an average of 10 a year, according to an analysis by The Washington Post. With around 100,000 public schools around the country, the chances that a school resource officer will have to confront a shooter is beyond slim. But bullying, group conflicts, and students who are depressed, defiant, or unsure of themselves? The officers will face those daily, and if they are going to fill the roles of both mentor and protector, they need to be properly prepared. That’s not always the case. 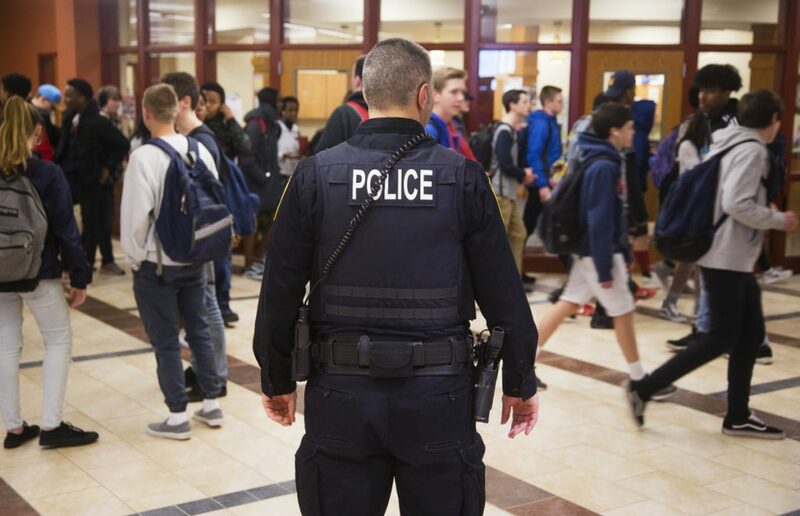 About 30 percent of schools nationwide now have a resource officer — a sworn officer as a full- or part-time presence in the school — but the effect is not always positive. Schools that add an officer typically experience an uptick in suspensions, expulsions and arrests, but that doesn’t mean they are making the school any safer. Critics say that too often the presence of a police officer escalates typical school conflicts and teenage acting out into chargeable offenses, introducing the legal system where it has no business being. Instead of a lecture and detention, a student ends up with a criminal record. That is particularly true of students of color, who are disciplined at nearly twice the rate of white students, according to the ACLU. If all of a sudden it’s a police officer and not the school handing down the punishment, then more black students are going to end up in major trouble for a minor offense. They’ll be sent to the juvenile justice system, not the vice principal’s office, and that can follow them for the rest of their lives. Instead, schools should consider hiring more psychologists, counselors and social workers who can work with students to solve problems before they get too big. Students who lose control at school often need help when all an improperly trained resource officer can provide are handcuffs. Yet there are as many 1.7 million students nationwide in schools that have officers but not counselors, and more than 10 million in schools with officers but not social workers. Districts who do hire resource officers should do so with open eyes. The officer’s role should be clear and limited, with a focus on creating a safe and healthy environment. Ordinary school discipline should not result in formal intervention by law enforcement, and the officer should be trained specifically to deal with the age group at the school. The vast majority of the officers — perhaps all of them — will never be involved in a shooting. But every one of them will face students who are angry, frustrated and anxious on a daily basis, and they have to be ready for it.